Hello SAM is a gourmet burger cafe that uses Alsco anti-fatigue mats, wet area mats, entrance mats, tea towels and wipes since they opened in October 2013. Alsco is happy to have serviced such an amazing and well-sought burger cafe. 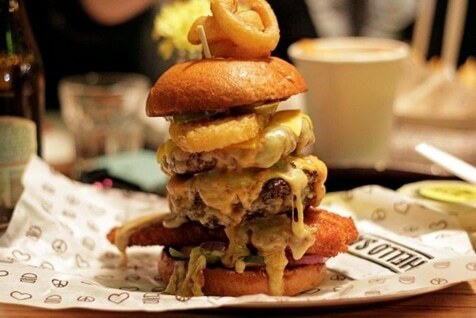 Have you heard of Hello SAM gourmet burger? Check out their fabulous story here. In September 2013, Katherine Sampson found a run-down café at the Northern end of Chapel Street. There had been four previous businesses in the site over the previous eight years. Katherine believed that she could reinvent the site and spent weeks researching the area, its local residents and surrounding customers. She decided that the area needed a casual dining establishment, catering for breakfast, lunch and dinner. The price point had to be at the lower end so that residents could eat there regularly. A burger café concept was decided upon and Katherine then set about creating a brand for the site. the name Hello SAM was born from her surname “Sampson”. Two New Zealand chefs were employed to create and unique menu, which would help create a point of difference in a quickly expanding burger market. 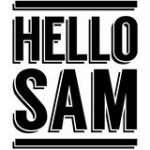 Hello SAM has been successful in the burger space, with a positive review from serious Burger Bloggers helping to grow the business. Katherine is now on the lookout for a second site and hopes to open another Hello SAM by Christmas 2015. Our Motto at Hello SAM is “We Make Burgers For Grown-Ups“. Featuring a huge array of burgers including 100% Angus beef, chicken, lamb, salmon, and vegetarian. We also cater for Coeliacs, vegetarians, vegans and for those with fructose intolerance. 1. How did Hello Sam – Gourmet Burger Cafe come to life? What’s the story behind its name? I purchased a run-down café in Chapel Street and converted it to a Gourmet Burger Café. As my surname is Sampson, I went with “Hello SAM” as a business name. We have many Coeliacs (gluten intolerance) come into our shop. they tell us they haven’t eaten a burger for years. They get so excited when they can sit and enjoy a burger, knowing that they won’t feel ill afterwards. 3. Do you have a funny story to share about one of your experiences in the business? We have a moist hand towel that we place on the side of our burger plates. One lady opened it up and thinking its was sauce, tried to squeeze the contents into her burger!! Consistency, great service and new products. Also, we’ve recently introduced Happy Hour Specials, between 3-6pm daily. $10 gets you a Simply Sam burger plus chips. On Friday, Saturday and Sunday we have $5 beers/ciders/wines from 3-6pm. 5. From your tasty menu, which one is your favourite and why? I change every few months. First it was the Spicy Sam. Then I switched to the Parmesan. Then it was the Aloha Sam. There are so many great burgers, so I don’t have a single favourite. 6. How do you make things lighter of hassle-free when you manage your business? Employ great staff, respect them, treat them well and they will look after the business while I’m not there to keep an eye on things. Recycle every can, bottle, container. Have a separate paper/cardboard compactor. Ensure that we separate our recycling from our rubbish. My team. They make my day. They all get along so well and we have a laugh whilst working away. 9. What’s one thing that Alsco does for you that no one else can? Provide great products with fantastic service. They were able to source the most unbelievable fatigue mats. Our lives have changed. I don’t suffer from lower back problems. My barista doesn’t have sore feet anymore. We are happy, happy, happy!! 10. How was your Alsco experience so far? Can’t fault it. The current support/admin team are always there to help and answer any questions I have. When is the Best Time To Visit Hello Sam? Alsco would like to thank Katherine Sampson of Hello SAM, for sharing her amazing story on how she became successful with her delicious burgers. Alsco supply feasible solutions to keep your organisation healthier, cleaner and safer while at work through a wide array of cost and resource efficient rental services. With Alsco Anti-Fatigue Mats, standing at work for a long time will not be a problem anymore! Pick up your phone and call our friendly representative – 1300 659 892 and get to know more of our products.